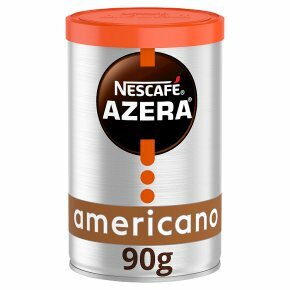 NESCAFE Azera Americano: A tasteful blend of instant coffee and finely ground roasted coffee beans, delivering a distinct freshness, perfect to brighten up your morning. Smooth and well balanced, with an irresistible layer of velvety coffee crema. Upliftingly tasty. Discover barista-style instant coffee with NESCAFÉ AZERA Americano. Crafted from a selection of Arabica and Robusta beans. A special blend of instant and finely ground roasted coffee. Enjoy a layer of velvety coffee crema with every cup. Savour a fruity aroma and a well-balanced flavour. Experience barista-style coffee moments at home. NESCAFÉ AZERA Americano is a carefully crafted blend of Arabica and Robusta beans that have been made into a premium instant coffee.